With modern, professional equipment and access to high quality ingredients, baking a cake from scratch is easier than ever. No matter what cake recipe you see in a magazine or pin on pinterest, there are a few universal rules that you need to follow before you even preheat your oven. I waited a long while to purchase my first sous vide machine (immersion circulator) and now that I have it, I’m discovering more ways I can use it to my advantage as a busy parent. After years of waiting for the price of sous vide immersion circulator to go down, I finally purchased my first sous vide unit. In the video below, I am unboxing the Avalon Bay SBS 100 sous-vide machine. Making a pineapple bowl looks more complicated than it really is. All you need is a serrated knife, a cutting board, a sturdy spoon or metal scoop and of course, pineapple. I show you how to make a pineapple bowl in this super quick tutorial. I ended up using the pineapple bowl as a serving dish for pineapple fried rice, but you can use it to serve chicken salad, fruit salad or even ice cream. Would you love to start making food at home more but don't even know where to even start? My free knife skills/meal prep course would be a good place to start! Green beans are a healthy side dish that accompany many family dinners. 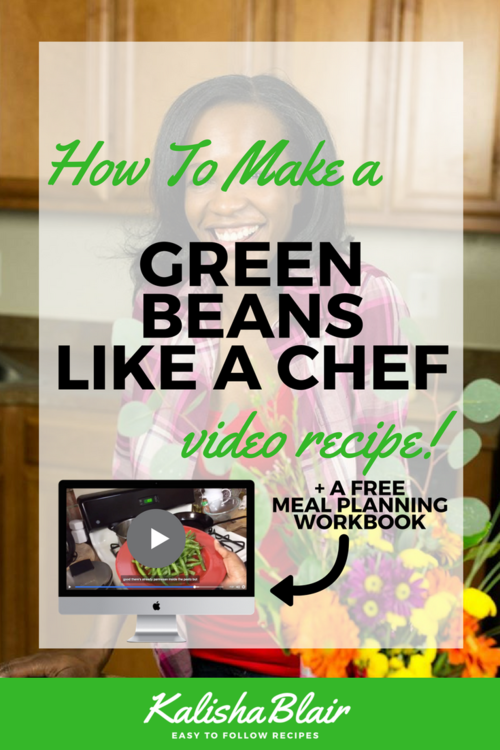 Watch the video to see how I made a quick and easy side dish with just green beans and pesto. It's so easy, you'll be adding it to your next menu! Would you love to start making food at home more but don't even know where to even start?